As an owner, reviewing as well as terminating employees can be frustrating and uncomfortable. Most of the frustration occurs when we act purely on instinct and emotion. To take the emotional stress out of getting the results you want from your employees, you need a simple process that works. Wouldn’t it feel amazing to follow a simple process to get the results you want, and remove all the emotional stress from the equation? By implementing the following materials you will become a highly effective leader who can easily review, fairly terminate, and motivate employees. This process should result in your employees lifting you up as an owner or manager. Not only will you be able to drive results but you’ll have an established hiring and firing process you can use with conviction. Ultimately I’m showing you an untapped superpower you already have… you just need the tools. Core values are not a new concept but we must review it as these values sit at the core of the scorecard process. What is a core value? For me, it’s a non-negotiable, meaning this is the way we do things at our/my company because we like doing it this way and feel by doing it this way we can have the greatest impact. We all have our own personal core values and this is a perfect place to look when creating your initial set of core values for your company. There is a way about you, the way you like to do things. What are those non-negotiable values for you? For me, the main one happens to be Integrity. Doing business with me will always have integrity at its core because that’s the way I like to do things. Integrity is extremely important to me in regards to executing on my vision. The core values at GorillaDesk are T.I.G.E.R … Tinker, Integrity, Growth, Empathy, Remarkable. These are all values I’ve practiced when the company started in the early days with just me, the founder. Tip: Using an acronym with your core values has the advantage of being easier to remember when your team needs to recall them. During the hiring process, I’m looking for alignment with our core values. It’s very important to discover the right questions to ask during your interview process to see if the potential hire is aligned with your core values. Your company’s core values can start simply as those values which are most important to you. What values have helped you get to where you are today? What values/rules do you like to play the game by? You don’t want too many. Five seems to be a sweet spot. I used to think formal reviews and scoring wasn’t for our small family company. I liked having a flexible pat on the back review style. This style does not lend itself well at all to producing the results you want for your company. It’s all too easy for employee reviews to turn into a back and forth emotional mess when there is no structure in place. I can recall multiple times becoming emotionally upset when employees “just aren’t getting it.” This feeling really bothered me so I set out to find a framework to resolve this. Whenever there is a problem I’m seasoned enough to know where to look, and the first place is the current process. I’ve created many processes in my company and was process driven except when it came to employee reviews. Reviews were the last process I put in place and I’m sure glad a mentor shared with me the tools I’m about to share with you right now. 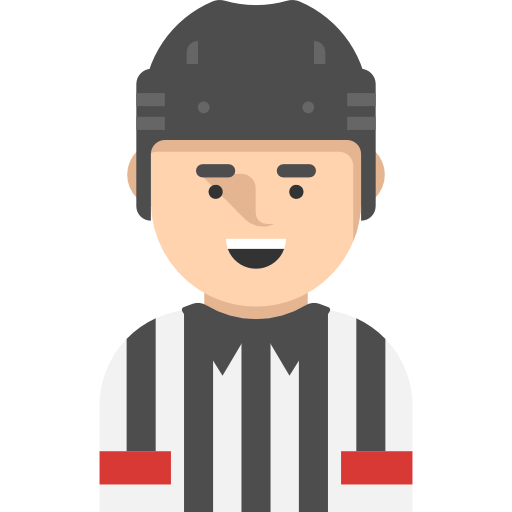 You’re in for a treat with this post as I’ve attached the 6 documents you’ll need to successfully score your team. The first of which is used to score your new employees for the first 30 days. Let’s review how the scoring works. The scoring choices here are [+], [+/-], and [-]. The goal is to hold a [+] in all areas which means the employee is completely aligned with management. If there is just one [-] then the employee moves to counseling to improve in this area. If there are two categories with [+/-] this is equal to one [-] and will also result in counseling to improve in these areas. You can see how strict this process is when it only takes one low score or two medium scores to move to counseling/coaching. Since you’re scoring this employee every day during the first 30 days you’re gaining that many points of communication for improvement to occur. For the first 60 days you’re reviewing the employee daily. From 60 to 90 days you’re reviewing twice per week. Beyond 90 days you can implement the scorecards as needed. From my experience, after the 90 days you should have an aligned employee or an employee you can safely let go based on the evaluations. If you look at the header of the scorecard, you can see how this scoring is completely based on core value alignment. Download the attached scorecards at the bottom of this post. Use Adobe Acrobat to customize the templates with your own core values. The next phase of the review process is the disciplinary counseling report. If we have one low [-] score or two medium [+/-] scores the employee moves into disciplinary counseling. 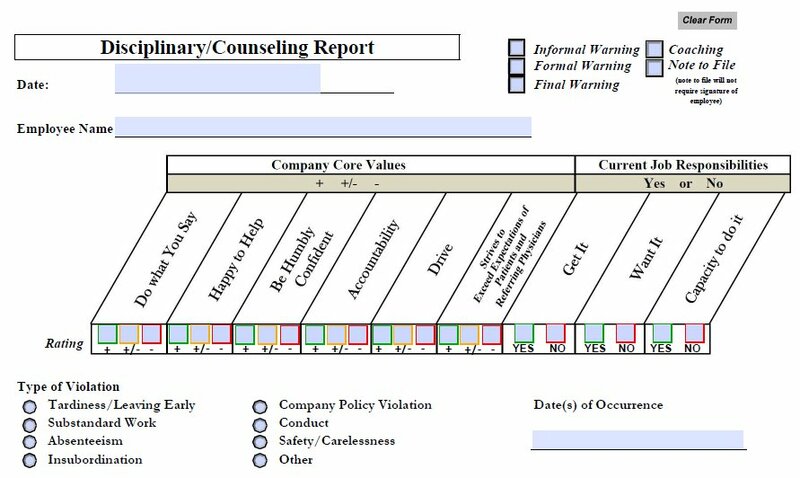 Counseling is a review process in which the manager scores the employee first, write’s his/her comments, and then sits down to talk through the scorecard. The counseling report is an opportunity to coach your employee. This is the time to help them level up. I find during the counseling review it works for me to come from a place of what’s possible for the employee. Talk about the facts and what’s actually occurring. I’m genuinely interested in helping my employee succeed. Coming from a place of unlimited possibility, allows me to create a strong connection with them. Ultimately you are there as a coach to support the employee so they can push you up on the playing field. Counseling reviews continue until the proper scores are met which would be all scores at [+] with a single [+/-] allowed. When an employee is in counseling, it’s very important at the end of each meeting to agree to a date when an improvement will be reached and what that looks like in detail. The of reviews in the counseling stage is really up to the manager and the circumstances. I would not allow more than 3 counseling reviews before declaring the Final Review notice, which would result in termination or a score increase. During the first counseling review, I want to have a conversation around specifically what’s not working. Next, create a goal with the employee to hit by a specific date which will be the next counseling review. Determine how many counseling reviews you allow before the executing on the final termination review. Use the Final Warning option on the counseling report when you’re on the last attempt to help level up the employee’s score. Communicate to the employee clearly around a goal to achieve before the next review or else the termination will occur during that same meeting. If your employee is not trying their best to turn the score around, they have opted themselves out of the job and will already be bought into WHY the firing is occurring when you break the news. You’ll notice on some of the forms there is an additional scoring area for Get It, Want It, and Capacity to do it. This is an addition to the scorecard and not necessarily required although I do recommend it. This scoring concept comes from the book Traction and adds another key layer. Get It: Does the employee fully understand the job requirements and responsibilities? Want It: Does the employee really want the role and deeply desires the position? Capacity: Does the employee have the ability to execute the role effectively? You’ll notice these are scored as a simple Yes or No. All three criteria should be met for someone who would be the ideal A player for the role you’ve created. It’s quite common to coach up Capacity if the employee is not experienced in the role. The performance evaluation form is used for employees on the right track and ready for a timed review. The employees who are aligned and performing well for you will need regular reviews typically done every 90 days or annually. When determining raises or bonuses the performance evaluations are my go to. These give you a concrete communication history between you and your employee. With confidence, you can look at past evaluations which are the same as conversations you’ve had with the employee. A managers role is to evaluate often and coach up. The people analyzer is a great scoring system for any manager to complete weekly. This is a complete team analyzer where you can score the whole team at once and fast. It’s also a great overall sheet to share with others on your management team. What I love about the analyzer is how quickly it is to fill out using the simple 3 tier scoring system [+], [+/-], and [-]. Without too much time and effort I can quickly score my whole team and act on the review process. The true power of these scorecards is the additional communication that occurs. This process will be uncomfortable just like anything that is new. The very first time I used these scorecards I personally experienced a large alignment shift with every employee. Download the attached scorecard templates to start on your path to successful reviews and a happier team. These free core-value evaluation templates will provide you with a complete system for reviewing, aligning and leveling up your employees.